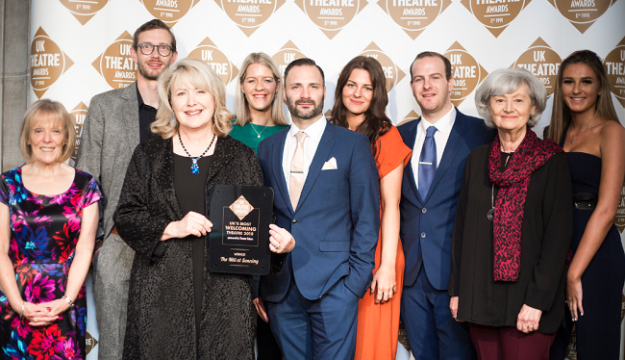 The Mill at Sonning are delighted to announce it has won the UK Theatre Award for the UK’s ‘Most Welcoming Theatre’ for the third year running. The Mill is the only theatre in the UK to have won the award three times. Sponsored by Theatre Tokens, the UK Theatre Award was voted by the public. Musical theatre star and The X Factor 2010 winner Matt Cardle presented the award to The Mill’s Managing & Artistic Director Sally Hughes who attended the ceremony with eight members of staff. The UK Theatre Awards were revealed yesterday (Sunday 14 October) during a lunchtime ceremony at London’s Guildhall. The Awards were hosted by Olivier-nominated musical theatre performer Tyrone Huntley, and presenters included Wendi Peters, Sharon Duncan-Brewster, Ria Jones, Matt Cardle, Emma Williams and Michael Ellis MP.